Twitarium is a project that I and my colleagues created together. 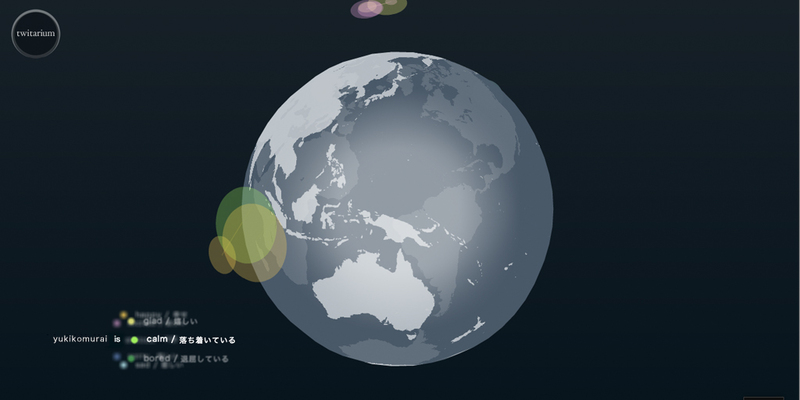 Using twitter API, it collects current twitter from all over the world and reflect them on the screen. My work filters twitter with emotional words and displays a color-coded circles. The diameter of the circles are in proportions with the length of the tweets. Tweets with the same emotional word are connected and that gives the impression that this world is much smaller and more intimate place than we feel in our usual life. We have submitted the work on Tokyo Graphic Passport 2010 and won people’s favorite award on digital section. I have done planning, producing, production management, design, flash, php-coding. © 2016 yukiko murai's portfolio site. All rights reserved.